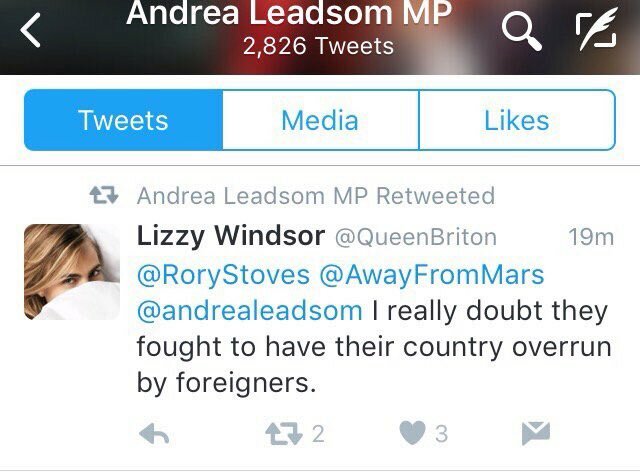 ......or Andrea Loathsome, as I've taken to calling her. So why do we need a new thread, then? mattomac wrote: She might get lucky. Or the rest of us might get unlucky. True, I would guess if she makes the final two she will get a cabinet post of some kind. There is a view that the internet is in need of a monitor for obscene and adult websites. Outside of cyberspace, we have bodies such as Ofcom and the British Board of Film Classification that continually work to ensure our children are not exposed to the wrong things. This could be implemented in some way online, whereby a website would have to have its content "rated" before being accessible online. While it sounds like a massive leap, the majority of new websites already go through testing when they are hosted to make sure that a site is intact and that files and content are free of viruses. This would simply be adding another check to the list, and in reality it is a burden already carried by film makers. Most Tory MPs clearly think she's a disaster area but she might tickle the party faithful's nuts with her Maggie tribute act. And get a Tory Jeremy Corbyn. They can have ours as well if they want. youngian wrote: Most Tory MPs clearly think she's a disaster area but she might tickle the party faithful's nuts with her Maggie tribute act. And get a Tory Jeremy Corbyn. They can have ours as well if they want. Only difference is she would have some power. Just taken delivery of a very interesting letter from someone who worked in the City alongside Andrea Leadsom. Iain Martin is a regular contributor to Reaction. I'd never heard of it, but it looks like some sort of right-wing blogging site. Aides to @andrealeadsom say @UKIP wd not be part of her Brexit negotiating team. Hard to see her and Gove not coming in the top the two. Crabb going to come 4th and not get a year Foxy voters. May is quite clearly ahead of all of them. Looks like the Tories are in the mood for the smack of firm government, a la Thatch. Jeebus, iy couldn't possibly be a Thatch tribute act, could it ? Is it Lead (atomic number 82) or Lead (as in dog lead)? I've heard both on news bulletins. Not that I give a toss.